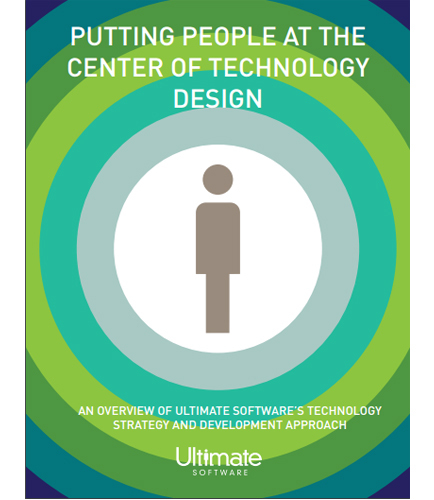 "People Management Solution and Strategies For Global Business"
This whitepaper explains the main drivers behind Ultimate’s people-first technology strategy and architecture, and how its approach is improving the work experiences for its customers and their employees. Human Capital Management is defined as the process of managing an organization’s employees for them to contribute significantly in the overall productivity of organization. Organizations have their pick of these HCM solutions is making the decision of ‘which is the best’ for your organization a challenging one. As the digital HR is a top priority and with this surge of understanding for the growing importance of digital HR, it must be acknowledged that choosing the right HCM platform is equally important. This whitepaper highlights the 7 critical factors that must be considered when evaluating a Human Capital Management (HCM) System that would most enhance your human capital processes and support your strategies. Some of them are: Native Cloud-Based Design for the simplification of the deployment of an HCM system HCM Systems must be Ecosystem Friendly - API Integration with Third Party Applications Automatic Calculations & Real-Time Responses- Right HCM platform must support these calculations BONUS ITEM – Reporting & Analytics These key functionalities are most important and when you put them together in an innovative and intuitive way, it transforms your entire approach to human capital management. What is HR Automation ? HR automation is the process to improve the efficiency of human resources departments through automating the manual human resource processes and eliminating information-centered risks. Human Resources, along with many other departments, relies upon document-driven processes to get thier work done. For example, employment contracts must be read and signed by new employees during the onboarding process.